Early Intervention in Psychosis team shortlisted for prestigious British Medical Journal awards. The team behind a pioneering programme which could shave as much as £63 million off the societal costs of psychosis has been shortlisted for the 2017 British Medical Journal (BMJ) awards. The awards, dubbed the ‘Medical Oscars’, have shortlisted the South Region Early Intervention in Psychosis team (based at Oxford Health NHS Foundation Trust), in the ‘Best Mental Health Team of the Year’ category. The Oxford Health team’s efforts at sharing best practice and training others have resulted in all 16 Mental Health Trusts across the South of England now meeting national targets for treating patients with a first episode of psychosis within 14 days; before the team’s intervention, only 8 out of 16 Trusts were meeting this target. The winners will be announced on 4th May in London. The BMJ awards attracted 290 entries this year, and the shortlist represents inspiring and pioneering teamwork which makes a real difference to patients. Psychosis is a mental health problem that causes people to perceive or interpret things differently from those around them: this can include hallucinations (where a person perceives things that aren’t there, such as hearing voices), or delusions, where a person believes things that when examined rationally are obviously untrue (such as believing that their neighbours are plotting to kill them). Early Intervention in Psychosis teams reach out to young people having their first episode of psychosis, and works intensively with them and their families, offering therapy and support. They also facilitate employment and education, and work to avert mental health crises which might otherwise lead to hospital admissions. 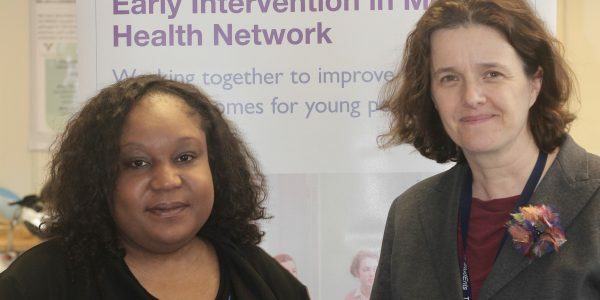 Earlier this year, a study led by team leader Dr Belinda Lennox found that these Early Intervention in Psychosis teams saved the NHS £4031 each year, for each person treated. If the service was rolled out across the whole country, this would mean that the NHS would save £33.5 million each year. But the team initially found that most mental health teams across the South of England were not equipped to meet new national targets, which aim for everyone experiencing a first episode of psychosis receiving treatment within one of these early intervention teams within 14 days of referral. The team gathered data on funding, staffing, services provided, and outcomes achieved from all 32 Early Intervention in Psychosis teams, across 16 NHS Trusts, spread across the South of England. As a result of their efforts, all 16 Trusts now meet national 14 day waiting time targets – only 8 did before the Oxford Health team’s intervention. As of October 2016, 83% of patients across the region are now assessed and treated within 14 days of referral, a result that is the best in the country and which far exceeds the national target of 50%. The team have also provided training for over 180 clinicians in the specialist treatment of early psychosis, and 45% of patients treated by Early Intervention in Psychosis services across the South of England are now in employment or education. Fewer patients need admission to hospitals, and more are in stable housing.